The oral cavity includes the lips, gingivae, retromolar trigone, teeth, hard palate, cheek mucosa, mobile tongue, and floor of the mouth. The major salivary glands are in close relation with oral cavity structures, although they are not part of the oral cavity. The tongue is part of the oral cavity; its anatomy is specifically described elsewhere (see Tongue Anatomy). The palatine tonsils, soft palate, tongue base, and posterior pharyngeal walls are part of the oropharynx; the oropharynx is not part of the oral cavity. The oral vestibule is bounded externally by the lips and the cheek mucosa and internally by the alveolar processes and the teeth. When the teeth are in occlusion, the vestibule communicates with the oral cavity proper via the intermaxillary commissure behind the last molar teeth. Lips. Arrow indicates red line, which separates dry vermilion from wet vermilion. Upper vestibule (upper lip everted). 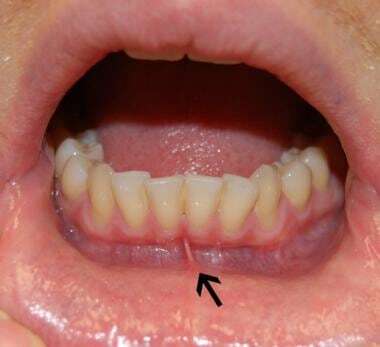 Arrow indicates upper labial frenulum. Lower vestibule (lower lip everted). 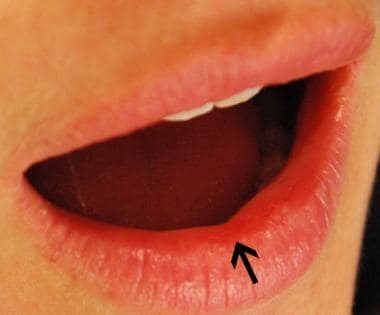 Arrow indicates lower labial frenulum. Opening of Stensen's duct opposite second upper molar (arrow). Asterisk indicates retromolar trigone. The gingiva (or gum) is a fibroepithelial mucosal tissue that surrounds the teeth and covers the alveolar jawbone. The alveolar process is the tooth-bearing area of the jaws. It is composed of a dense outer cortex (known as the cortical plate) and looser inner trabecular (or medullary) bone. The area of cortical bone that lines the dental socket (or alveolus) is called the lamina dura. The retromolar trigone is a small triangular-shaped subsite of the oral cavity. It is the portion of mucosa that lies behind the third molar tooth, covering the anterior ramus of the mandible. The base of the triangle is posterior to the last inferior molar tooth; the apex is in continuity with the tuberosity of the maxilla behind the last upper molar tooth. The retromolar trigone is bounded laterally by the gingival buccal sulcus and medially by the anterior tonsillar pillar. The teeth are calcified structures whose main purpose is mastication. Each tooth is composed of a crown, which is the exposed portion above the gumline, and a root, which is embedded in the jawbone. Deciduous teeth (also referred to as primary or temporary teeth) are the first to emerge in the oral cavity and are progressively replaced by the permanent (or adult) dentition. There are 20 deciduous teeth, comprising 8 molars, 4 canines (or cuspids), and 8 incisors. The permanent dentition consists of 32 teeth: 12 molars (including 4 so-called wisdom teeth or third molars), 8 premolars (or bicuspids), 4 canines, and 8 incisors. Incisors have a thin occlusal edge, a somewhat flat crown, and a single root. Their main purpose is to cut food. Canines have a pointed shape and single long roots. Their main function is to pierce and tear food. The occlusal (or masticatory) surface of molars and premolars is characterized by pointed structures named cusps. Premolars usually have 1 or 2 cusps and 1 or 2 roots. Molars usually have 4-5 cusps and 2-3 roots, the shape of which is highly variable. The purpose of molars and premolars is to grind and crush food. The hard palate is concave, and this concavity is occupied mostly by the tongue when it is at rest. The hard palate is subdivided into the primary and secondary palates. 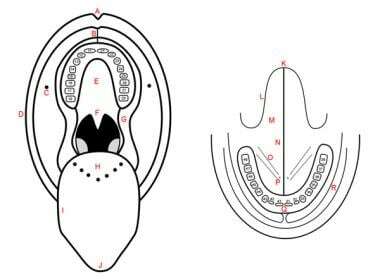 The primary palate is separated from the secondary palate by a small depression behind the central incisors termed the incisive fossa, where the incisive foramen opens. The soft palate marks the beginning of the oropharynx and is the movable posterior third of the palate. It forms an incomplete septum between the mouth and the pharynx. 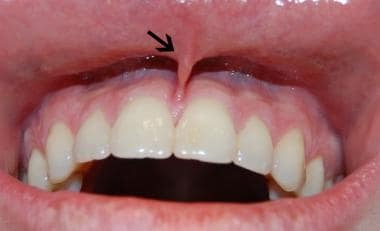 It is marked by a median raphe and is continuous with the roof of the mouth and the mucous membrane of the nasal floor (see the image below). Hard and soft palates. A: transverse rugae of hard palate; B: median raphe of hard palate; C: median raphe of soft palate. The velum is prolonged by a median free process termed the uvula and 2 bilateral processes termed the palatoglossal and palatopharyngeal arches or pillars, which join the soft palate to the tongue and pharynx, respectively. The fauces represent the space between the cavity of the mouth and the oropharynx. They are bounded superiorly by the soft palate, inferiorly by the root of the tongue, and laterally by the pillars of the fauces. Floor of mouth. 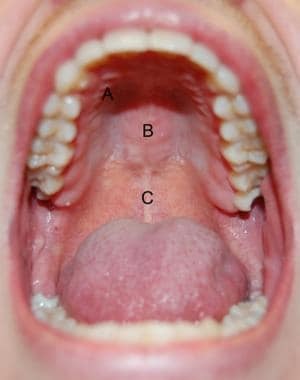 A: lingual frenulum; B: sublingual papillae. The tongue is a mobile muscular organ that occupies the major part of the oral cavity and part of the oropharynx. Its main functions are pushing food into the oropharynx during swallowing and forming words during speaking, although it is also implicated in mastication, taste, and oral cleansing. The macroscopic and microscopic anatomy, musculature, nerve supply, and vasculature of the tongue are specifically addressed elsewhere (see Tongue Anatomy). The major salivary glands are large paired exocrine glands that communicate with the mouth and pour their secretions into its cavity. They comprise the parotid, submandibular (or submaxillary), and sublingual glands. Lining mucosa is found on the cheeks. It covers striated muscle and major salivary glands. The epithelium of the lining mucosa is nonkeratinized, although in some places it can be parakeratinized. Parakeratinized epithelium is similar to keratinized epithelium, except that the superficial cells do not lose their nuclei. The teeth are composed of 4 distinct and unique tissues. The crown is covered by a layer of enamel, a highly calcified and acellular tissue. The enamel is the hardest tissue of the body. The central portion of each tooth is composed of the second tissue, the pulp. The pulp is a fibrovascular tissue containing odontoblasts whose purpose is innervation, vascularization, and repair. Beneath the enamel and around the pulp lies the dentin, which makes up the bulk of each tooth. The dentin consists of calcified tissue containing numerous microscopic channels known as dentinal tubules, which harbor odontoblastic processes. The fourth dental tissue, cementum, and consists of a thin layer of calcified tissue covering the dental root. The apical portion of the tooth is covered by cellular cementum, whereas the remainder is covered by acellular cementum. The cementum is bound to the alveolar bone via specialized connective tissue fibers, which form the periodontal ligament. The alveolar mucosal surface consists of lining mucosa covering the alveolar bone. The soft palate is covered with lining mucosa similar to that described above. The floor of the mouth is covered with lining mucosa similar to that described above. The basic structure of a salivary gland is that of a branching duct that has the principal secretory cells (the acinar cells) at the proximal ends of the branches and an opening into the oral cavity at the other end of a single collecting duct. Four morphologically and functionally varying segments exist in each basic salivary gland unit: acinus, intercalated duct, striated duct, and excretory duct. Two types of cells exist in each segment: abluminal cells and luminal cells. The oral cavity is scattered with 500-1000 minor salivary glands within the mucosa and submucosa of the cheeks, lips, floor of the mouth, hard and soft palates, retromolar trigone, and tongue; the anterior hard palate and gingivae are devoid of these glands. The facial artery provides the major arterial supply to the lips. It branches out into the superior and inferior labial arteries 1 cm lateral to the corner of the mouth. The superior labial artery supplies the upper lip. The inferior nasal artery supplies the lower lip. These arteries anastomose with each other to form an arterial ring. The pterygopalatine portion of the maxillary artery branches into the posterior superior alveolar artery, the infraorbital artery, the artery of the pterygoid canal, the pharyngeal branch, the descending palatine artery, and the sphenopalatine artery. The skin of the cheeks drains to parotid and submandibular lymph nodes. The upper lip and the lateral parts of the lower lip drain to the submandibular lymph nodes. Lymph from the central part of the lower lip drains to the submental lymph nodes. Lymph from the mucous membrane of the cheek drains to submandibular nodes and to upper deep cervical nodes. Superficial cervical nodes may also be involved. The mandibular nerve (V3) descends through the foramen ovale into the infratemporal fossa and divides into the auriculotemporal, inferior alveolar, lingual, and buccal nerves. Fordyce granules are visible sebaceous glands that are not associated with a hair follicle. They can sometimes be found in the submucosa lateral to the corner of the mouth and in the cheeks opposite the molar teeth. Torus palatinus and torus mandibularis are benign bony outgrowths of the palate and mandible (see the image below). Tori of the oral cavity occur in 3% to 56% of adults and are more common in women, Asians, and Inuits. They usually manifest in the second decade and continue to grow throughout life. Torus palatinus in Asian woman. 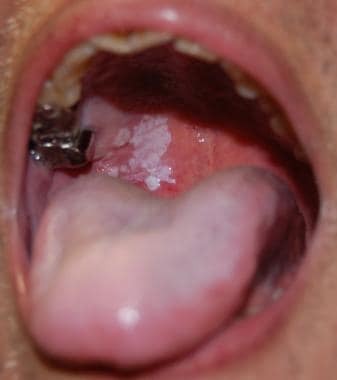 Oral cancer is more likely to occur in leukoplakia and erythroplakia (see the image below). Both conditions are diagnoses of exclusion, representing, respectively, a white patch and a fiery red patch that cannot be categorized as any other disease. (See Premalignant Conditions of the Oral Cavity). Squamous cell carcinoma of floor of mouth in middle-aged man. Cleft lip and palate are among the most common congenital anomalies. Cleft lip and palate occur approximately once every 1000 Caucasian births, and isolated cleft palate occurs once every 2000 births. Kernohan’s classification is the system that is most widely used to classify cleft lip and palate according to disease severity. Cleft lip may be unilateral or bilateral. Cleft palate may be complete, with extension into the nasal cavity, or submucosal, with a preserved palatal mucosa. Primary cleft palate is anterior to the incisive foramen, and secondary cleft palate is posterior to it. Isolated cleft palates may be associated with syndromes such as Pierre-Marie-Robin sequence, Stickler syndrome, Treacher-Collins syndrome, Apert syndrome, 22q11 anomalies, and many others. Salivary gland neoplasms make up 6% of all head and neck tumors and most commonly appear in the sixth decade of life (see the image below). Most salivary gland tumors arise in the parotid and submandibular glands, and fewer than 10% of tumors arise in the minor salivary glands. Most minor salivary gland tumors are malignant, usually manifesting as painless masses on the palate or floor of the mouth. Diagnosis is made through fine-needle aspiration biopsy, and primary treatment is surgical. Probst R, Grevers G, Iro H. Stuttgart. Basic Otorhinolaryngology: A Step-by-Step Learning Guide. vii. New York: Georg Thieme Verlag; 2006. Snow JB, Wackym PA, Ballenger JJ. Ballenger's Otorhinolaryngology: Head and Neck Surgery. 17th. Shelton, Conn. ; Hamilton, Ont. ; London: People's Medical Pub. House/B C Decker; 2009. Edge SB, American Joint Committee on Cancer. AJCC Cancer Staging Manual. 7th ed. New York: Springer; 2010. Szpirglas H. Pathologie de la Muqueuse Buccale. France: EMC, Encyclopédie médico chirurgicale; 1999. Van De Water T, Staecker H. Basic Science Review for Otolaryngology. New York: Thieme; 2006. Moore KL, Dalley AF, Agur AMR. 6th ed. Clinically Oriented Anatomy. Philadelphia: Wolters Kluwer Health/Lippincott Williams & Wilkins; 2010. Eroschenko VP, Di Fiore MSH. Di Fiore's Atlas of Histology with Functional Correlations. 9th ed. Philadelphia: Lippincott Williams & Wilkins; 2000. Ross MH, Pawlina W. Histology: A Text and Atlas: With Correlated Cell and Molecular Biology. 5th ed. Baltimore, MD: Lippincott Williams & Wilkins; 2006. Ellis GL et al. Tumors of the Salivary Glands. AFIP Atlas of Tumor Pathology. 4th series. Washington, DC: American Registry of Pathology in collaboration with the Armed Forces Institute of Pathology; 2008. Paff GH. Anatomy of the Head and Neck. Philadelphia: Saunders; 1973. Flint PW, Cummings CW. Cummings Otolaryngology--Head & Neck Surgery. 5th ed. Philadelphia: Mosby/Elsevier; 2010. 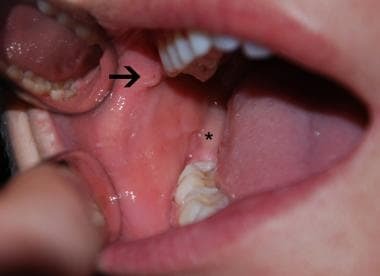 Mouth of 3-year-old patient. 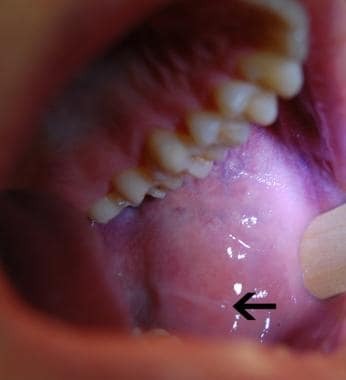 Bottom of mouth is bordered by tongue. Superior border of mouth is hard and soft palate. 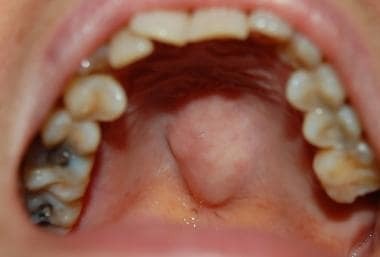 Lateral aspects of mouth are inside linings of cheeks. Cheeks contain ducts that empty saliva of parotid glands into mouth. If tongue is lifted, floor of mouth is visible with ducts that empty saliva of submandibular glands into mouth. Video courtesy of Dr. Ravi Elluru. Medscape Reference thanks Ravindhra G Elluru, MD, PhD, Associate Professor, Department of Otolaryngology Head and Neck Surgery, University of Cincinnati College of Medicine; Pediatric Otolaryngologist, Department of Otolaryngology, Cincinnati Children's Hospital Medical Center, for the video contribution to this article. The authors wish to thank Dr Owen Woods and Dr Marie-Helene Geoffroy for their notable contributions to the multimedia in this article.